Created by the CDC ‘legal department’, the Refusal to Vaccinate form was created as a direct response to the growing number of toxic vaccines, and the parents who are becoming educated on this issue. If you follow the CDC’s recommendation you will be giving your child up to 37 vaccines before the age of 16. The Refusal to vaccinate form was created as a way to overcome vaccine awareness, however many parents signing it have no idea what fate they are resigning themselves and their children to, it is essentially a signed, witnessed confession, in the worst case scenario it could lead to your children being removed from your custody. 1. Signing the form attaches a child ID number to every applicable child that can be used by everyone from the child’s school to the NSA in order to see which children have not been vaccinated. 2. The HPV is listed on the form under its’ scientific term in order to discourage parents from making the link to the dangerous vaccine called Gardasil. 3. Singing the form will allow the Police state registry to be able to track your child’s vaccine status. 4. The contract is essentially a form of propaganda. The cover up surround this document has been exposed in the paper Health Hazards of Disease Prevention (2011). 5. The parent is misled as to the real dangers of the vaccines, the risks are not explained in the physicians surgery but are refereed to the CDC website. Full disclosure almost never happens at the physicians are surely aware that parents would be highly discouraged if they knew the real risks. 6. 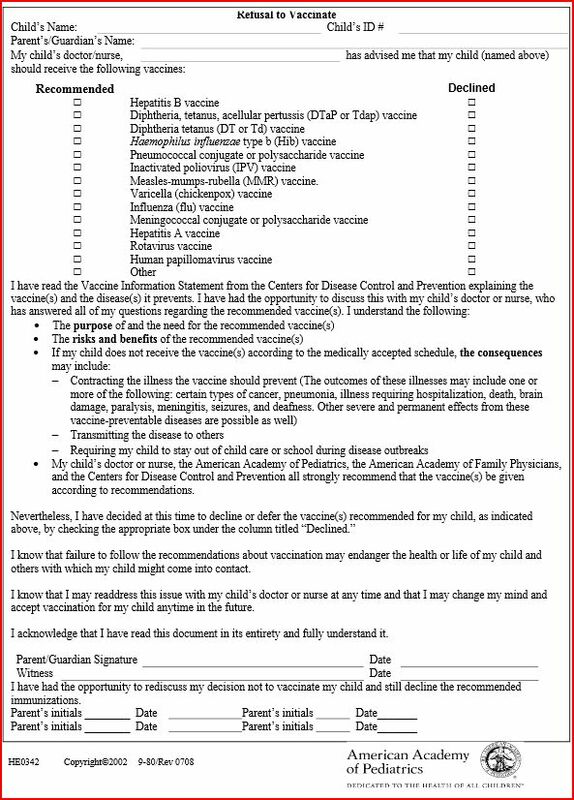 When signing, the parents are asked to agree that they “understand the following: The risks and benefits of the recommended vaccine(s)” How can the parent agree to this when they risks have not been properly explained to them? Not to mention the hidden facts about these vaccines that are not included in the package as they have been ‘covered up’ for many years. 7. Parents are co-oerced by being told if they negate to vaccinate their child they could suffer grave illness and even death, but they are not told the same thing could happen because of the very vaccines themselves. 8. This refers to the “herd immunity myth” of 1993 which states that if other children have been vaccinated then they wont contract a disease from your child if the vaccine has worked. This idea has been proved unscientific in many cases. Physicians are rewarded with high reimbursement fees the more vaccines he/she administers. Physicians have been given immunity form any possible lawsuits by a liability exemption. If a vaccine harms your child they cannot be sued and the more vaccines they administer, the higher their vaccine “rates”. This is a corporation headquartered in the State of Illionois, receiving money from drug corporations for advertising in their journal, and other medical literature. This organization heavily relies on what they unwittingly believe to be a “government” health advocacy agency-the Center for Disease Control (CDC). This particular body is a corporation situated in the State of Kansas, not the nationwide government. It too receives money for advertising and as before, puts its’ faith in the CDC. Finally, the CDC is actually a company situated in the State of Georgia. The government would have you believe its is part of a legitimate government body, but it is not. It is a private, profit-led organisation. It is listed on Dun and Bradstreet under the umbrella of private, for-profit United States corporations, harboring ties with other companies who have a history of being corrupt for their own gain. By signing you are basically admitting that you may be risking the health and well-being of your child. It is aking you to consenting to you child possibly being taken from your care by healthcare professionals, to be placed in an unknown area of isolation to be exposed to different diseases with or without testing. 11. Signing the document you admit to understanding the significance of the contractual document ‘in it’s entirety’ As highlighted in this article, no parent can fully know the significance or consequences of admitting this. By signing you are accepting the false information in the document as true, agreeing to your child being removed from your custody and admitting that are choosing to do what you choose not to be good for your child. 12. Finally, in signing the document few parents know it can be used against them in a dispute over custody. The fear of being sued drives physicians to push for signatures, and this is part of the reason they are so eager for you to sign. Instead of the Refusal to Vaccinate, a little-known alternative is the Vaccination Notice. This notice corrects misconceptions about vaccines, the herd immunity myth, and the CDC. It also brings the liability (or lack thereof) to the physicians attention. YOU WILL NEVER BELIEVE HOW THE BOTTOM OF A STAPLER IS ACTUALLY MEANT TO BE USED!